McKinney, Texas, police misconduct at swimming pool party: America’s ugly history of pool segregation. The police misconduct in McKinney, Texas, is part of America’s long, fraught history of race and swimming. The violence at Friday’s Texas pool party was captured on video. 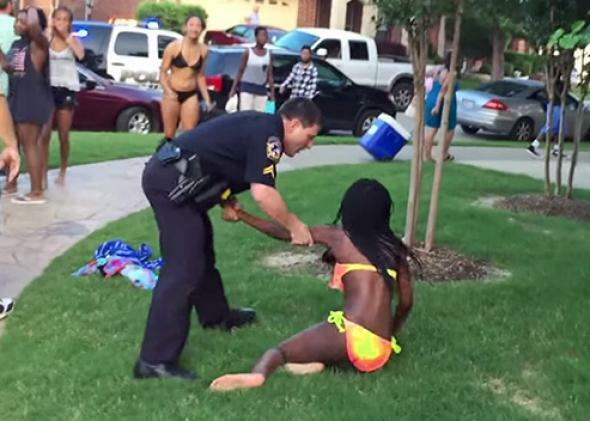 On Friday a group of black teenagers went to a community pool in McKinney, Texas. They were there for a pool party, advertised on social media. At some point, not long after they arrived, nearby residents—who were white—began to harass the swimmers. When one woman told the teens to “go back to Section 8 housing,” a fight broke out. Another resident called the police, who—according to one witness—began to arrest the black teenagers, ignoring the white swimmers in the group. When one bystander—a 15-year-old black girl—wouldn’t leave, an officer handcuffed her, threw her to the ground, and pinned her with his knee. And when two of her friends approached the officer struggling with the teenage girl, he drew his gun to scare them off. All of this is on video, and it’s drawn millions of views as another example of police abuse against black Americans. The officer has been put on administrative leave, and the department is investigating the incident. It’s easy to just focus on the police misconduct and excessive use of force at what was an end-of-the-school-year party for teens. But the fact that it took place at a community pool in a largely white area gives it additional weight, in that it echoes the long and violent struggles over integrated swimming in the middle of the 20th century, struggles that changed the residential landscape and redefined civil society for a generation—and now, generations—of Americans. For a time, swimming was America’s national pastime. Between 1920 and 1940, local, state, and federal authorities built nearly 2,000 municipal pools in towns and cities across the United States. You could find them in metropolises like Chicago and Philadelphia or small Kansas towns with fewer people than city tenements. These were communal, public spaces, and Americans loved them. In 1937, St. Louis, Missouri, counted 1.4 million swimmers in its municipal pools, writes historian Jeff Wiltse in Contested Waters: A Social History of Swimming Pools in America, who also points to a 1934 article in Fortune magazine that estimated that upwards of 30 million Americans swam in pools a total of 350 million times each year. And so whites segregated the pools. But in the 1950s, this barrier fell apart as civil rights activists launched assault after assault on Jim Crow swimming. In 1949 after a city official said he “could see no basis for keeping Negroes out of the pool,” a group of black Americans—mostly boys and girls—tried to integrate the Fairground Park pool in St. Louis. In retaliation, a crowd of 200 whites—armed with bats, clubs, bricks, and knives—tried to chase blacks out of the pool. They were soon joined by thousands of other white St. Louisians, who beat black swimmers and chased others away, attacking any black American who came in view. But eventually in St. Louis and other cities, black Americans and their allies prevailed. In a series of rulings beginning in 1950, federal courts ended segregation in municipal pools, inching toward an attack on the “separate but equal” doctrine of Plessy v. Ferguson. The white reaction was predictable. In the summer of 1948, the Fairground Park pool recorded 313,000 swims. The city closed the pool after the riots, but in 1950—the first summer of interracial swimming in St. Louis—the number of recorded swims in public pools plunged to 60,000. “The attendance statistics for subsequent summers reveal the full effect of desegregation,” writes Wiltse. “[Ten thousand] swims in 1951, 20,000 in 1952, 20,000 in 1953, and 25,000 in 1954.” Likewise, at another city pool, attendance dropped from an average of 300,000 swims per summer to 24,000. And at both pools, most of the patrons were black. The primary appeal of club pools, however, was the assurance of not having to swim with black Americans. Civil rights laws applied only to “public accommodations,” so private pools could legally continue to exclude black swimmers even after the courts had forced cities to desegregate municipal pools. Many swim clubs, especially those located in suburbs accessible to black Americans, explicitly barred black families from joining. For example, swim clubs in Chevy Chase, Bethesda, and other suburbs close to Washington, D.C., passed bylaws when they first organized in the 1950s that limited membership to white persons. Racial exclusion at private pools—bolstered by residential segregation—continued through the 1960s until it was broken by court order in 1973. But this was only a small deterrent to Americans who didn’t want to swim with blacks. As backyard pools became more affordable, hundreds of thousands—and then millions—of Americans began to build them. Whites would maintain a kind of segregation by withdrawing from the world of public swimming. By 1999 there were 4 million such pools, a permanent part of suburban life. Every part of this incident—from the setting of a private pool in a predominantly white suburb to the angry neighbors and eventual violence—is informed by this fraught history of race and swimming. Whether they realize it or not, each participant—from the kids to the residents to the police—was playing an old part in an even older story of anger and confrontation.